Spring settles on me with an irrational anxiousness. Maybe, to think about it, it’s not all that irrational. The symbolism of Spring is a big deal. For instance, in ancient myth, the onset of Spring is due to the return of Persephone, Zeus’s daughter, to the earth. She has been abducted by Hades and taken to the Underworld. (She was a babe.) 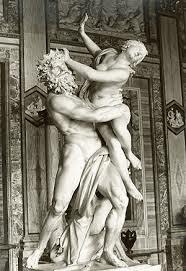 Zeus demands her return, a demand Hades obeys, knowing it best to keep Zeus off his back. But first Hades tricks Persephone into eating pomegranate seeds, which ensures her return. Before her abduction, Persephone tended her garden, planting seeds and generally being a goddess of nature, the original Earth Mother. When she escapes the Underworld and wicked Hades, she returns with flowers. Spring arrives. But alas, she was tricked into eating those seeds and so, sadly, she will eventually return to Hades. And the Earth will grow cold. Again. I said Spring makes me anxious. Its arrival seems a big deal in some fashion. And as a big deal, I feel beholding to do right by it, by the season and what it symbolizes. That’s why I said it is irrational: I’ve laden Spring with a good deal of portentous heaviness. Or maybe not–maybe I’m not being irrational. Maybe being serious about rebirth and escaping winter and living to see another season should be taken seriously. The ancients thought so. Persephone escapes to return to her aggrieved mother, Demeter. She escapes Hades and his unmentionable Underworld demands. Most of all, she returns to Mother Earth with renewed life–things of a serious nature all. It was in this context that I took a magic marker and drew a line about four feet long, horizontal, on the wall of my office-man-cave. To the far left of the line I wrote Antiquity. To the far right: Death. The end of the line for me. Then I started to make some notes along the line, left to right. Confucius, Socrates, Jesus, moving right, through the dark ages with the Black Plague death of William of Ockham, to the happier days of the Renaissance, Alberti, , Erasmus, Michelangelo and my personal favorite, Montaigne, fast-forward to the Romantics, Beethoven, Brahms and the bunch, to Goethe, Liszt, rushing to the moderns, Thoreau, Nietzsche, Stravinsky, faster now, Joyce, Hemingway, Picasso, Cage, Nabokov, and so on until the line stops. Game over. Under all this I put big labels, Iron Age, Dark Ages, Industrial Revolution, Age of Flight and so on. Lastly, I made note of the major things: the Gutenberg Bible, Columbus, Landing on the moon, the atom bomb, the silicon chip. Spring. The time-line. A life and a context. The more I think on it, Spring is a big deal. It is a reminder, a connecting thread to the tapestry of our humanness, the time-line to which we all subscribe. Spring ushers in fresh growth, a return to life and the overarching scheme of things. On my small and personal scale, I am simply curious about where I fit in, about the history of the species and how I am delivered to this place, here in the sun, observing Persephone tend her garden.